The following charts are somewhat divided by particular decades: the 1980's, the 2000's and the 2010's; except to keep the Flashback sets and Brand New Series sets together, with a separate box and wrapper chart per respective release period. There are some processes in collecting and tabulating that naturally resist definition and standardization, that are more art than science. A lot of guesswork, if you will. Mark Newgarden has mentioned before that there was no 'deeper meaning' to the wrapper and box codes in the 80's, just a numbering system for release, but I have tried to give some logic to the mayhem. The charts are not all-inclusive, if material is missing, please don't hesitate to message me with the information. The FIRST and THIRD number of 0 and 21 within the code identifies the product as a wrapper, for example: 0-490-21-01-7. If the first number is a 1 and the third number is a 40, the product is a box; except for some Rack and Jumbo Packs. The SECOND set of digits is the product number, it eventually stabilizes at #490; in this case it represents the Topps Garbage Pail Kids brand. The FOURTH set of numbers in the wrapper code is the 'print run'; for the most part, these are numerical for the given year. For example, there were a total of 14 print runs of Garbage Pail Kids wrappers in 1987; 0-490-21-01-7 thru 0-490-21-14-7. The FIFTH number in the wrapper code is the given year. For example, 1987 is the given year for this code example; 0-490-21-01-7. 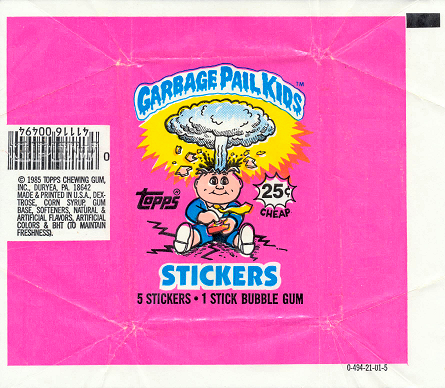 The three times the wrapper pattern fails for the Original Series GPK: The transition from 1st to 2nd Series and 3rd to 4th Series within the same given year, the print runs start back at numeral -01-; the releases did not become sequentially numerical until the later 4th Series wrapper. When a Series is corrected or changed and re-released, as in the second print run of the 2nd Series and the third and fourth print runs of the 4th Series; both for name changes, but this could be coincidental ... and the 6th Series and 10th Series wrapper changes; but these are not necesarily different print runs, possible change within the same print run. And, within the 4th Series, the second set of numbers -01- and -02- take the place of the numerals -03- and -04-; highlighted in grey, which would make sequential sense for the year 1986. The FOURTH set of numbers in the box code is the 'print run'; for the most part, these are numerical for the given year. For box codes, the same box code may house multiple wrapper print runs. The FIFTH number in the wrapper code is the given year. For example, 1986 is the given year for this code example; 1-491-40-01-6. The FIRST and THIRD number of 0 and 89 or 54 within the code identifies the product as a wrapper, for example: 0-757-89-01-3. If the first number is a 1, 2 or 5 and the third number is a 30, 50 or 03 the product is a box; including specialty packaging. The SECOND set of digits is the product number, which varies on location, depending on the type of release; Hobby (#757), Retail (#758) or retail Specialty packaging (various numbers). The FOURTH set of numbers in the wrapper code is the 'print run'; for the most part, these are numerical for the given year per type of release; Hobby, Retail and retail Specialty. The FIFTH number in the wrapper code is the given year. For example, 2003 is the given year for this code example; 0-757-89-01-3. The codes stay pretty sequential for the All-New Series and Flashback releases; but the 'product number' is drastically different than the Original Series code meaning, it seems to identify the product description and type of packaging. We tend to see wrapper codes more combined by the time the latter All-New Series and Flashback sets roll around. The FIRST and THIRD number of 1, 2 or 5 and the third number is a 30, 50 or 03 the product is a box; including specialty packaging, for example: 1-757-30-01-3. If the first number is a 0 and the third number is a 89 or 54 the product is a wrapper. Retail B1-B6 Bonus Box Packs"B2"
The same wrapper code descriptions specified above for the All-New Series and Flashback releases also apply to the Brand-New Series 1 set below. However, Topps has changed to completely new packaging (PKG) numbers for Brand-New Series 2 onward which at this point consists of a 4-digit number, but futuristically speaking can reach a 6-digit number in sequence if necessary. The codes no longer act as an identifier for product or packaging type, box nor wrapper and no longer contains the year. 2015 S2 : 30th Anniv. The same box code descriptions specified above for the All-New Series and Flashback releases also apply to the Brand-New Series 1 set below.